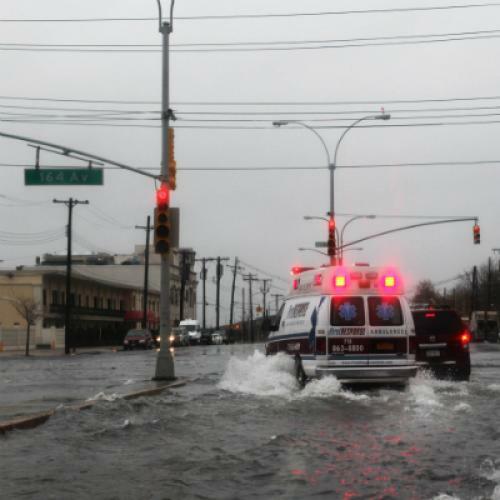 Could Hurricane Sandy lead to a constitutional crisis? Since 1845, Congress has mandated that the presidential election take place on the Tuesday after the first Monday in November. But no one in the waning days of the Tyler administration anticipated a giant hurricane hitting the East Coast within a week of Election Day. In fact, there is no precedent whatsoever for a natural disaster of this scale before a federal election. A devastating storm, like Sandy, could produce several constitutional and legal crises if voting can’t take place on November 6. Keith Gaddie, a professor of political science at the University of Oklahoma who focuses on elections, notes that, “[while] the Constitution had mechanisms in place to deal with [the 2000 presidential election], this one may reside out of the realm of process to resolve.” The founders saw the risk of electoral ties and close results, but extreme weather was not a priority in 1787. In fact, the only federal precedent that deals with delaying elections has to do with the tangled history of congressional races in the post Civil Rights South. In the 1982 case Busbee v. Smith, which addresses an attempt by Georgia to delay congressional elections to fix discriminatory redistricting, the District Court for the District of Columbia noted “federal law contemplates that those elections may, under certain circumstances, be held at other times.” Georgia moved the general election for Congress in two districts to November 30. More importantly, in a follow up case to Busbee, the 11th Circuit said Georgia could hold runoff elections in races where no candidate got a majority by noting that “A plurality outcome in the general election is similar to an election postponed due to natural disaster or voided due to fraud in that each is contemplated, yet beyond the state’s ability to produce. It is this common element that makes their occurrence an ‘exigent’ circumstance.” Those vague words are as close to a precedent as 200 years of federal jurisprudence provides. Section Five has traditionally been used to address technical problems rather than actual legal issues. In the one truly extraordinary circumstance -- September 11 -- no one complained when New York’s primary election was postponed, even though three of the city’s five boroughs are covered by the Voting Rights Act. However, the stakes and the level of partisanship are much higher in this year’s fierce presidential election than in a comparatively benign mayoral primary. The only reason that the Presidential election was fixed to occur on only one day in 1845 was to prevent voter fraud. According to a 2004 CRS report, Congress was concerned that in past elections, voters had moved from state to state to cast ballots on different elections. (A practice then known as pipelaying). Little else has been done to adjust the process since. As Rick Hasen, a professor at University of California, Irvine and proprietor of Election Law Blog notes, it would still be legal for presidential electors to be chosen by the state legislature, rather than voters. However, this would likely produce an uproar. According to Hasen, “ultimately, these things are political and if a state ends up doing something, it’s up to Congress, [which sets the rules for federal elections].” The solution would not be guided by statute since there is so little precedent but instead by what is both expedient and politically acceptable. The basic statutory framework and handful of court cases would be a guide, not an answer. Instead, like any other response to a natural disaster, adjusting Election Day would simply require improvising.